We’ll start with the ugly. *points to picture* This is me on Monday morning with no caffeine in my system. The Good: Lawyer Guy is out of MICU. The Bad: He’s not home yet and there is no release date on the horizon. The Good: Moving along on revisions/edits of COWGIRLS DON’T CRY. The Bad: I have plenty of time so I’m procrastinating a little. Okay, a lot. The Good: I’m caught up on all my DVR’d TV shows. The Bad but Good: All my favorites are coming back after the Olympic hiatus. The Good: Lots of reading done, and enjoyed the books I read. The Bad: I bought even more books to add to the TBR pile. So…was your weekend good, bad, or ugly? This entry was posted in Writing Life and tagged coffee, family, lolpic, Monday, reading, writing. Bookmark the permalink. 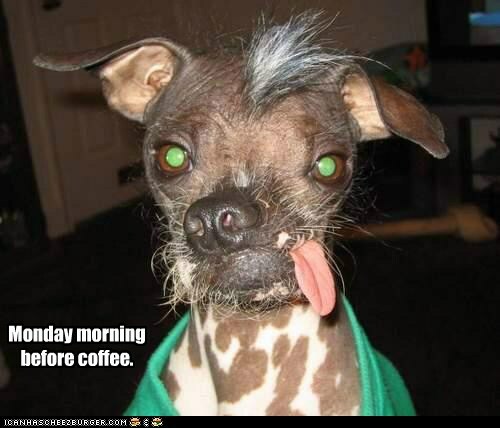 That dog should not be viewed before coffee. Jus’ sayin’. Good: I got a response from an agent that wasn’t a rejection. Bad: It wasn’t a request for more pages or an offer of representation either. That was pretty much the highlight of my weekend. My thoughts and prayers are still with LG – good to hear he’s our of MICU, hope he’s home soon!! I’m not happy with B.E.s comment – my curiosity is piqued! Good – got my fridge cleaned out and did the laundry. Hey, I made it to Chapter 5! Barring any more emergencies, I’ll make good headway this week. Dang that cold for lingering! It needs to go away already. I’ll be nice and not ask you to come clean out my fridge. I’ll have to do that one of these days soon. I’m getting a new one but it won’t be delivered for awhile so I’m procrastinating that too! Hrm…I wonder when National Procrastination Day is…. Sorry for all the bad but at least they are balanced with good. Bad: both my daughters, who’ve been coughing since the beginning of Jan. got ear infections as a result 😦 I’d rather be sick than my babies !!! Poor babies! May you ALL get well soon! Ah ha – that might be the reason (VA I mean). We had a CICU but our MICU was just called the ICU – we didn’t bother with the ‘medical’..
Glad LG is out of MICU! Hope he will be home very soon. Good: Walked over 2.5 miles for the first time since before my surgery. Bad: Foot was swollen later that day. Good: Trying compression socks to see if it helps with swelling. Will report more later. Bad: Washer started having water drip in the drum after wash was finished. Good: Finished newest JD Robb book and loved it! Glad to hear LG is out of the MICU, know everyone will be glad when he gets to come home! BAD: wanted to be more productive, will get better once the weather starts to even out. BAD: I got no writing done and my productivity was with my nose in book/tablet,but I enjoyed the reading so that is what counts. Hope you’ll start to feel better! The good? I finally got my tree down, laundry almost done, kitchen Coulter cleaned and the spawns closet is done. At least my part. She has to put the stuff away. I also got some stuff cleared off the DVR. The bad? Rascal is still at the vets and I don’t think shrnis coming home. We are going to go talk to the vet tomorrow. He was there when we adopted her from them and he’ll be there now. The Spawn has an appt with the Neurologist first tho. Its been a month an her concussion is not much better. Thanks to obamacare we had to wait for them to fix a mess they made. Get used to it folks. I told my husband if he dies I am not remarrying, I’ll live in sin. I’m not losing my tricare. Saturday was nothing but problems at work. I need chocolate but its not on my diet. Too many points!! Jeez, don’t EVEN talk about government health care. I almost wish LG was still in MICU. At least they cared up there. Down in the regular ward? Warehoused. All the vets are simply warehoused. And now they’re talking about cutting everything again!?!?!?!?! Nope. I’ve always said I’d keep my politics off the net as much as possible. And I know you mostly agree with me anyway, so preaching-choir. I’m so sorry about Rascal. 😦 So hard when the fuzzy kids are sick. Big hugs to you. And dang, poor Spawn, too! There’s got to be something else going on. Glad you got her in to the Neuro! Keep me posted.